PETALING JAYA: To the casual observer, the annual International Real Estate Federation (FIABCI) Malaysia Property Award (MPA) might just be glitz and glamour, but previous victors have attested that winning has certainly helped boost their business in some way. Yeow Thit Sang ... Winning the awards had a number of intangible benefits. FIABCI-Malaysia president Yeow Thit Sang said winning the awards had a number of intangible benefits. “It helps boost the winner’s branding and marketing. It also helps generate publicity to get their products to another level,” he said. Perdana ParkCity Sdn Bhd marketing and sales director Susan Tan said when the company won the MPA for best residential (low-rise category) for its Adiva Parkhomes at Desa ParkCity in Kuala Lumpur, prices of the houses shot up. “We noticed some price appreciation for Desa ParkCity properties in the secondary market with Adiva enjoying as much as 30% additional increase in prices after the awards were announced,” she said. The following year, Perdana ParkCity’s Adiva bagged the FIABCI Prix d’Excellence Awards 2010 for the residential (low-rise) category in Bali. “Obviously, winning did put Desa ParkCity in the spotlight and we have benefited from the exposure as more purchasers and investors are keen on other offerings (that we have) available,” said Tan. Sunrise Bhd assistant general manager for branding and community development, Anne Tong, said winning at FIABCI was like “icing on the cake” for the company. “Accolades from prestigious professional bodies such as FIABCI builds credibility for the Sunrise brand, which will in turn instill customer confidence in our products and services,” she said. Tong said winning at FIABCI helped to elevate awareness to purchasers on its product quality and service excellence. Sunrise has won accolades at FIABCI for projects such as Mont’Kiara Palma (1997), Mont’Kiara Sophia (2001) and Mont’Kiara Damai (2005). Selangor Dredging Bhd communications and corporate affairs manager Lina Othman said among the benefits of winning a FIABCI award was that it gave credibility to the development as it was recognised to be one of the finest in the country. “It also gives credibility to the company for being able to come up with an award-winning building. This of course helps with marketing of other developments as it is a testimony of the company’s commitment and capability in developing quality homes,” she said. Selangor Dredging won the MPA in 2009 for its Park Seven development (residential high-rise). The project was subsequently runner-up at the Prix d’Excellence 2010. FIABCI Malaysia will be organising the 2010 MPA on Nov 11 in Kuala Lumpur with Malayan Banking Bhd as the official sponsor. A total of 10 categories will be contested. The Selangor government, through the Selangor State Development Corporation (PKNS), will spend RM140.7 million to develop Bukit Botak. Menteri Besar Tan Sri Abdul Khalid Ibrahim said the development would involve 1,422 single-storey terrace houses which would be offered to the landowners for RM99,000 each. "If the landowners don't want the houses, PKNS will buy them from the landowners at RM170,000 per unit," he said after the project's ground breaking ceremony in Selayang today. The houses bought by PKNS would then be offered to the public at a price based on the size of land per unit, he added. "The project is part of the economic stimulus package introduced by the state government which among others focuses on redevelopment of stalled housing projects like Bukit Botak," Khalid said. He said the project was being carried not for profit but a charity. The Bukit Botak development project involves 201 acres and a resettlement of 2,300 families who have been waiting for over 20 years since the project began in 1986. The houses are expected to be ready for occupation by June 2012. DRB-HICOM Bhd plans to improve the balance of revenue contribution from its services, automotive and property businesses over the next five years as it seeks to expand. Currently, its motor vehicle business makes up some 57 per cent of revenue, followed by its banking, insurance and power plant maintenance services at about 40 per cent. Property makes up less than 2 per cent of revenue now, but DRB-HICOM wants to boost this to 20 per cent in five years. "I never like to put all my eggs in one basket," group managing director Datuk Seri Mohd Khamil Jamil told reporters at a briefing in Kuala Tahan, Pahang, yesterday. 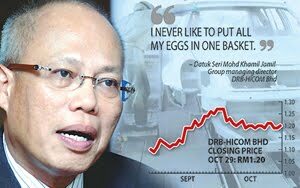 DRB-HICOM, controlled by Tan Sri Syed Mokhtar Al-Bukhary, reported net profit of RM472 million in the financial year to March 31 2010, 29 per cent down from the year before mainly because it gained almost RM600 million from an asset sale last year. Revenue hit a record of RM6.3 billion. The group plans to launch properties with a total gross development value of RM9 billion over 10 to 15 years. This will be a mix of residential and commercial properties. It has some 607ha near Mount Austin, Johor, which will be developed into a new township. "There are still pockets of land in DRB which are very prime," Mohd Khamil said. They include a piece of land in Taman Wahyu in Jalan Tun Razak, Kuala Lumpur, and tracts of land in Shah Alam, Selangor. This month, it plans to launch Glenmarie Gardens, a high-end bungalow project. As for its motor vehicle business, it aims to sign a definitive agreement with Europe's Volkswagen AG (VW) next month. VW had signed in August a memorandum of understanding with DRB-HICOM to produce VW cars from 2012 at the group's plant in Pekan, Pahang. "The final negotiations are going on well and the parties are finalising the terms," he said. Eventually, the deal may include the export of VW cars to Asean countries, among other things. DRB-HICOM is also still looking for a foreign partner to buy 30 per cent of its Islamic lender, Bank Muamalat Malaysia Bhd. It holds 70 per cent of the bank currently. It was in talks with five foreign parties and one local firm, but the talks fell through amid the global financial crisis last year. Asked about the weak performance of its stock, Mohd Khamil said it could be due to the fact that the group was too diversified. It is also classified under the industrial sector on Bursa Malaysia although services have become a big part of its business. "If shareholders understood the nature of our business, the share would definitely escalate and show their true value," Mohd Khamil said. Apart from Syed Mokhtar with 55.92 per cent, its other main shareholders are the Employees Provident Fund with 9.11 per cent and Khazanah Nasional Bhd with 5.13 per cent, according to its 2010 annual report.